The DP is designed for students aged 16 through 18. At Stockton Collegiate, DP years are 11th and 12th grades. physically, intellectually, emotionally and ethically." ​Schools must be authorized by the International Baccalaureate Organization to offer the DP. Stockton Collegiate was initially authorized in 2010 with a renewal in 2017. 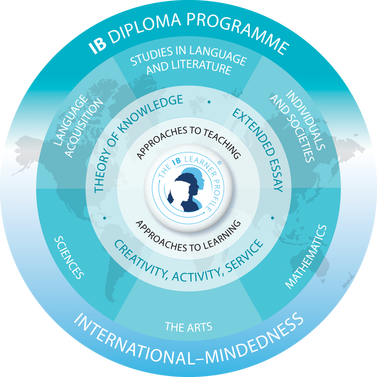 Stockton Collegiate is an IB Continuum school offering three IB Programmes. The three programs are integrated, build upon one another, and offer a rich, rigorous education that enables students to be problem-solving, critically-thinking, life-long learners able to pursue any educational and career path. Stockton Collegiate DP students have written on a wide range of topics in all subjects. An IB education prepares students for college. IB students are prepared for the work load and for the thinking, reading, and writing required in all disciplines at the university level. DP courses are college level courses. Colleges and universities recognize the value of an IB education. At Stockton Collegiate, classes meet on an A/B day schedule of 95 minute periods so a student has four periods each day. Students in all grades benefit from access to robust internet service in all classroom across all buildings. DP students are issued laptops. All students have a school email address. Classrooms are equipped with Apple TVs and monitors. Questions about DP? Contact Manuel Aguilar, DP Coordinator.